Main Category: Commercial Fun Food Equipment & Supplies | Material: Wooden | Hayes Specialties Corp.
BAMBOO IS A VERY RENEWABLE SOURCE.THESE STICKS ARE AS STURDY AS WOOD. These Bamboo skewers are 5.25 inches long .25 inches thick. Make delicous candied or caramel apples with these bamboo skewers. Perfect for Corn Dogs. BAMBOO IS A VERY RENEWABLE SOURCE.THESE STICKS ARE AS STURDY AS WOOD. These Bamboo skewers are 5.25 inches long .25 inches thick. Make delicous candied or caramel apples with these bamboo skewers. Perfect for Corn Dogs. 1000 per box with 10 boxes per carton. 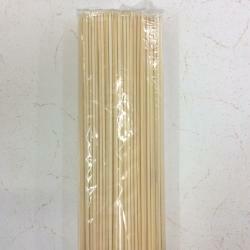 Bamboo skewers 18Inches long X 1/4 inch thick. 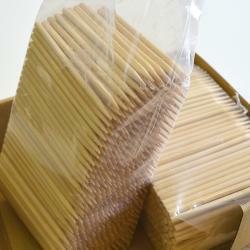 These bamboo skewers are great for Saratoga Swrils, fondue dipping, barbeques, and especially sish kabobs. 250 per bag with 8 bags in a carton. BAMBOO IS A VERY RENEWABLE SOURCE.THESE STICKS ARE AS STURDY AS WOOD.